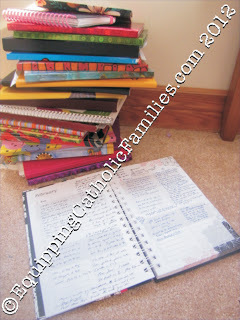 I just love it when people combine their passion for the Catholic Faith AND crafts. 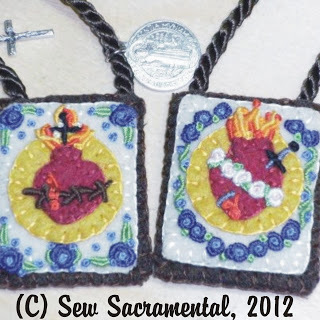 Check out these awesome hand-sewn scapulars! These look exquisite…look at the detail! No, I’m not getting a commission for any orders of these awesome capulars……they are just too inspiring to not share! Find out a little more about God’s Heart for You…or check out my GIVEAWAY. 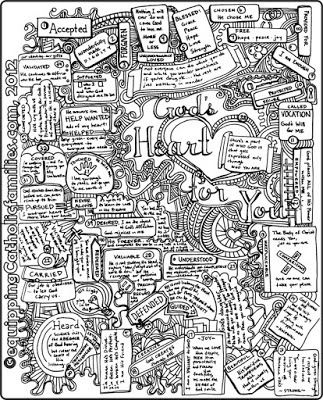 You will even find a link to download the God’s Heart for You Prayer Doodle and use it as a mile marker, coloring the tags for each chapter as you read through the 40 reflections. for the upcoming Easter Season? 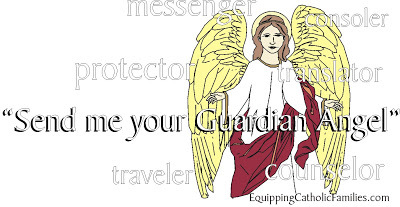 Could you use a little reminder of God’s Love for YOU? I was speaking with my spiritual director and confessor. Almost as an afterthought, I told him that sometimes I didn’t feel forgiven, even after confession. He explained that it was possible to be overscrupulous…but he also mentioned the lifelong confession. I knew instantly that I was being called to do this…and it was terrifying. 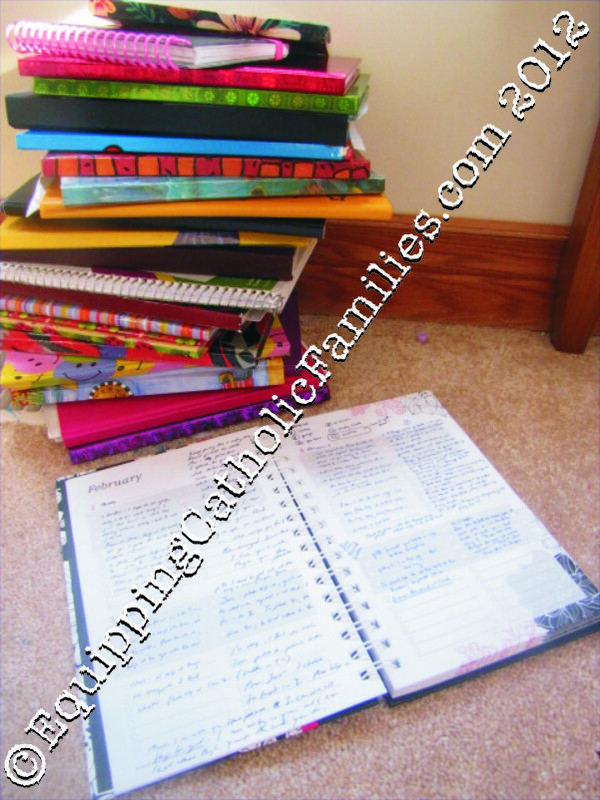 I spent the next 2 months preparing for a lifelong confession…not because anyone should necessarily take two months to prepare, but because the only confessor I could imagine asking…was the one who had suggested it…and he lived 4 hours away. We booked my lifelong confession for a retreat that he would be chaplain at. I prayed. I reflected. I asked the Lord to show me what I needed to confess…and boy, did He. I remembered things from a long time ago…and other things that I had probably already confessed…loosely, vaguely, conveniently omitting frequency or severity. I wrote everything down, especially if I wasn’t sure if I had confessed properly before. I remember crossing the threshold into the room where I was to have my lifelong confession. As I stepped through the doorway, I looked down at my shoes and I was thinking “I can still turn around and run!”. It was kind of how I felt every time I walked into the hospital to have a baby…a little anxious and fearful; only then…running away wasn’t an option. It wasn’t easy…in fact it was one of the hardest things I have ever done…to speak, out loud, a bunch of things that I was ashamed of. I had never been so deliberate or specific or thorough …during confession. I can still feel how incredibly, awesomely relieved I felt after that confession. 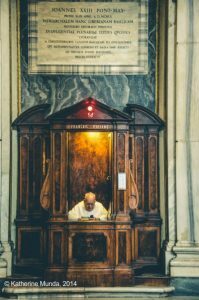 I understood the Mercy of God and the power of confession monumentally, unbelievably, giant-steps bigger in the absolution of that confession, than I had ever felt or understood before. It really took. Things that I had felt mortifyingly embarrassed and ashamed about, have been released from my guilt. 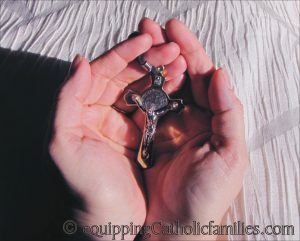 I know it’s the Mercy of God, and Jesus’ humongous Suffering and Death on the cross that gives us the incredible gift of confession and ability to erase our sin…but there is no doubt in my mind that I paid the little tiny price…as big as I could offer by humbling myself in front of a priest, a friend who I love and respect so much. This was no anonymous confession. I think being prepared and having true contrition are conditions for confession (I’ve been trying to look up the exact wording, but I can’t find it). I don’t think I could have been more prepared or more (mortifyingly!) sorry. No detachment, but full accountability …and in return I received Jesus’ Love and Mercy… just for me. My confession was one of the most powerful experiences of God’s Love that I’ve ever had. It almost made my heart stop to do it, but I wouldn’t have changed a thing. And that list I wrote of my past sins? I destroyed it. I would have set it on fire if it wouldn’t have set the sprinklers off at the hotel where the retreat was. My spiritual director / confessor and good friend once signed a card to me with these words. Remember that you are unconditionally loved by God and sustained at every moment by His Grace. Pray about it. Are you being called to do a life-long confession? Talk to a priest and book an appointment. You should probably give him the heads-up that this would be a life-long confession. This is not a 5-minutes-before-Mass-starts-and-there-are-people-waiting-in-line-behind-you kind of confession. Spend time in prayer, in preparation for this special confession. Ask the Lord to help you remember everything that you need to confess. Write it down…but you might want to keep that list hidden or use some serious code. Be open to God’s Grace, His Infinite Mercy and His Unconditional Love for you. …no matter what you have to confess to Jesus, through a priest. Priests are AWESOME and compassionate and have the power through Jesus to free you from whatever you need to be freed from. Go to confession. Have a blessed Lent! with activities and crafts and games that they like to do anyway? that celebrates their Journey of Faith? 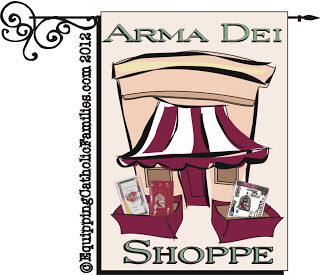 The Arma Dei Shoppe just opened! 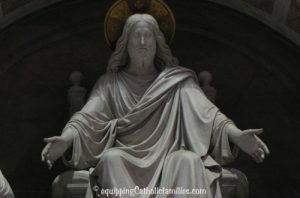 Check out our Journey with Jesus through the Sacraments! 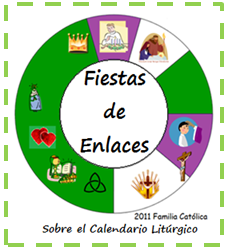 …to print for a whole family or class! Celebrate your child’s Journey of Faith! 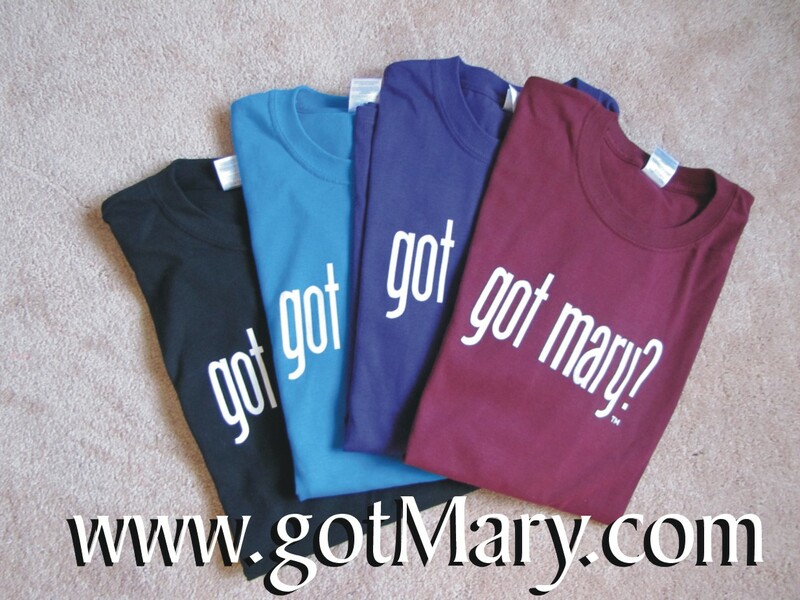 Got Mary? Awesome T-shirt GIVEAWAY! Please help me out and support my FIRST special co-hosted GIVEAWAY!! 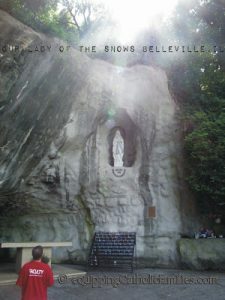 this Feast of the Immaculate Conception: December 8, 2011! 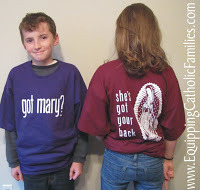 Aren’t these great shirts I found at a recent Catholic Conference? 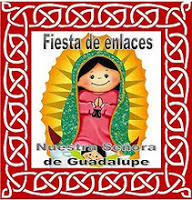 Check out Our Lady of Guadalupe on the back…perfect timing! 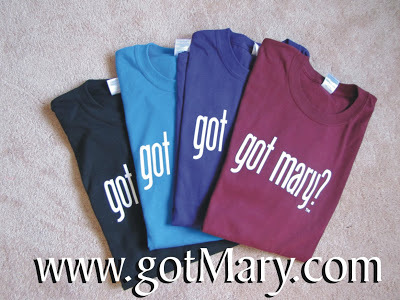 You could win a Got Mary? T-shirt! Check them out and enter to win! ENTER the SWEEPSTAKES with 3 little steps! OR Got Mary? facebook page . plus some Saint-filled stocking stuffers! Visit the Our Lady of Guadalupe Link Up as part of the Festival of Links! 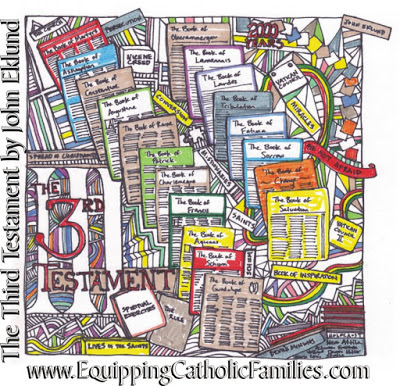 This is my Book Badge Review and Doodle Summary of The Third Testament. 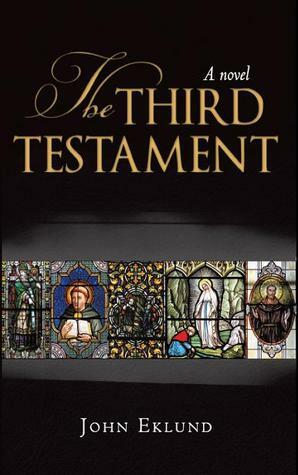 John Eklund writes of the journey of Fred Sankt, who, in the midst of personal crisis feels compelled to record historical events and figures within the context of a third installment of the Bible: The Third Testament. Presented through the thoughts, conversations and discoveries of this character, Eklund’s approach removes himself from presumption: because after all, who in this day and age could write an addition to the Bible that would be widely accepted as a necessary and Holy Spirit-inspired expansion of our sacred scripture? 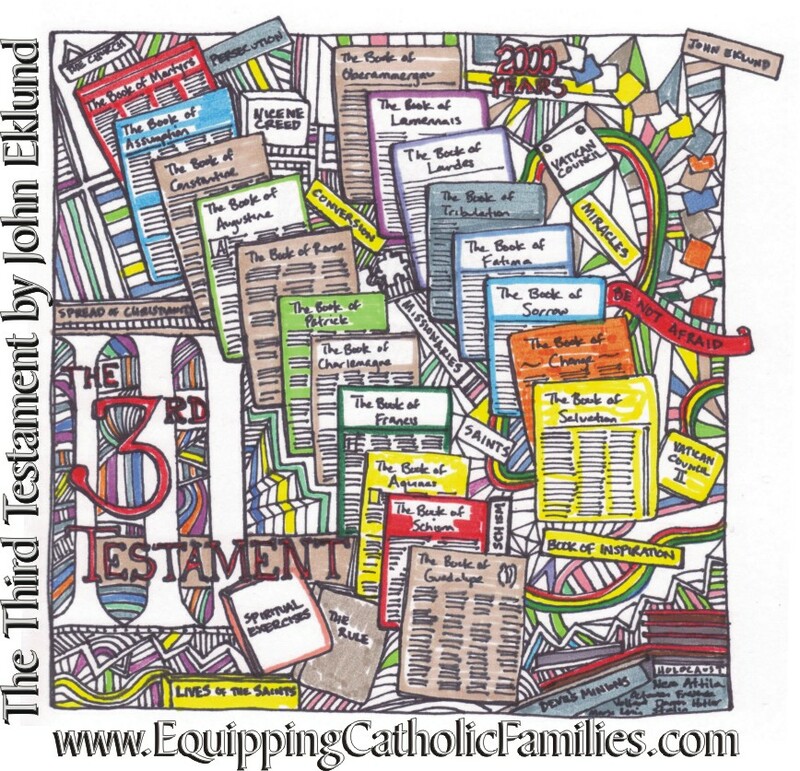 Book Badge Review and Doodle Summary of The Third Testament. I just made a new blog badge button. their Faith on their Blog! 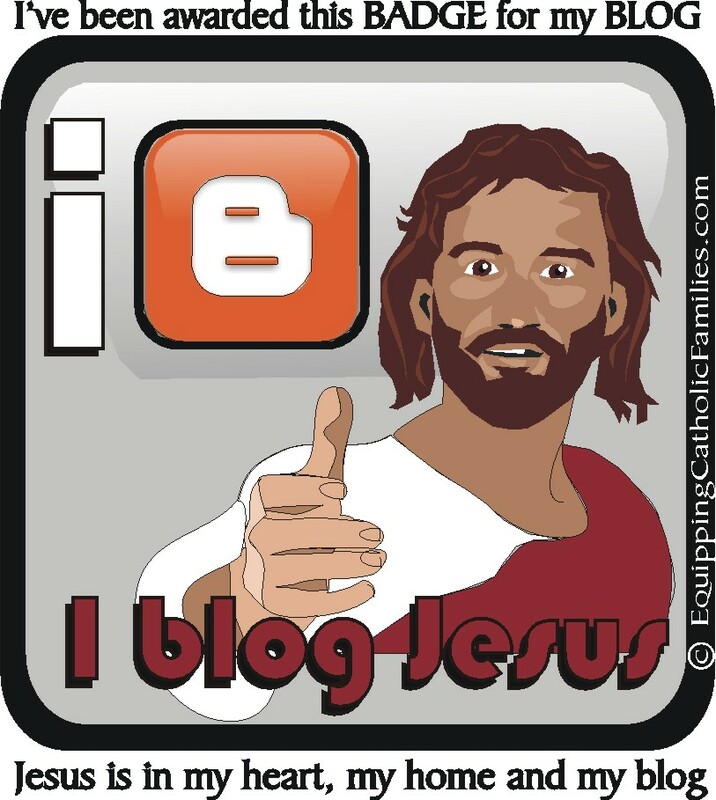 Who would you like to give the I blog Jesus Badge to? The friendly and simple presentation of Padre Pio’s Guardian Angel’s presence in his life is profound, refreshing and inspiring. 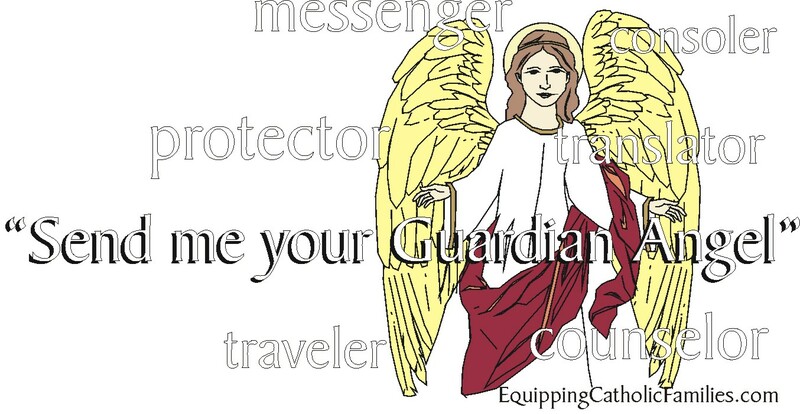 It challenges us to better acquaint ourselves with our own Guardian Angel and to take advantage of the help that they are delighted to offer us. 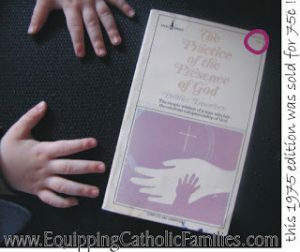 You may need to go to the EWTN catalogue to purchase it. on my Book Badge Review & Doodle Bucket List! 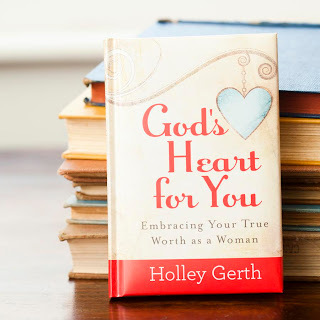 God’s Heart for You by Holley Gerth! Here is a short excerpt from the book, but it’s not enough! but you’ll probably want Holley’s book too. He says to the little girl, “I want you on my team. He says to the woman at the party, “I think you’re beautiful. He says to the older woman, “I place great worth on your life.